Last week I described to you how wonderful Wednesday ended for me, let's go right into Thursday. Another day of mowing grass and chomping up weeds. 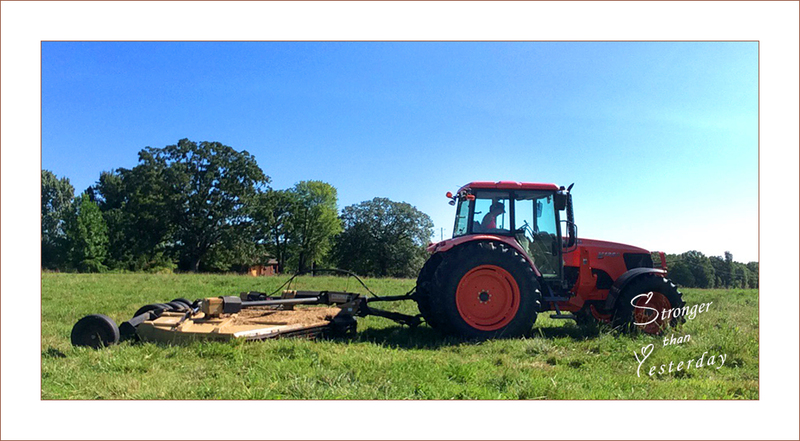 Two sections of pasture were left before I could move to the West side of the acreage. Yellow rays of sunshine were cascading down upon our farm this morning. 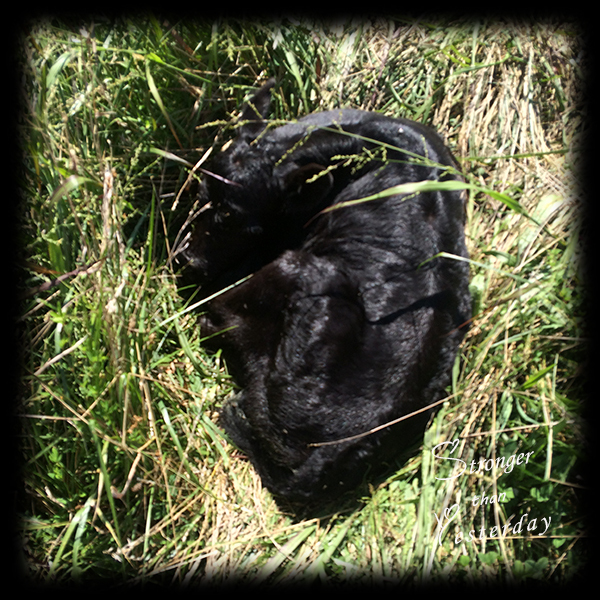 My first and immediate task was to locate the calves born the day before. 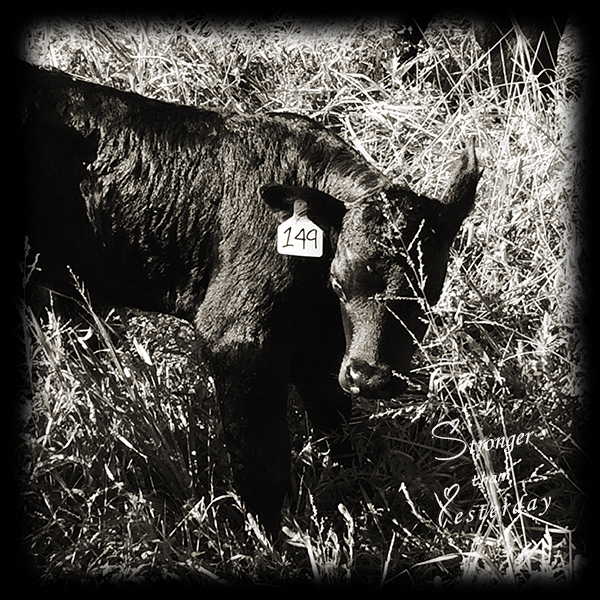 Summoning my amateur calf bawl, Cows 131 and 149 came running, right to calf 149. 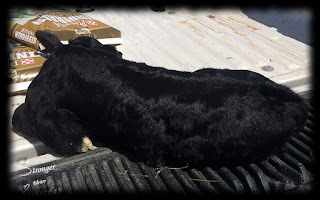 Standing twenty feet from the calf and assessing that they were both calm and the calf was lazily climbing to his feet, I pulled the truck beside him and put a tag in it's right ear. Texting a photo to my husband with the words, safely and efficiently, he responded with, "How did I know?" Without saying it he warned me to be careful and that I knew what he meant before leaving for work that morning. Cow 149 was taking extreme security measures the evening before which did not allow my husband to tag her calf. I didn't want to pass up an easy opportunity and I just love that I can accomplish it. Driving around the field, bawling, I could not summon Cow 131 to show me where she hid her baby girl. Beginning with the section farthest from Calf 149, I began cutting grass. Finishing I moved to that patch, again calling to Cow 131 and she will not give up her location. Sighing, I cut the entire rectangle gritting my teeth, my body so tense that my shoulders were up to my ears and my eyes darting right and left constantly. Assuming she hid her somewhere in the grass that I had cut the day before and I'm not able to see her, I move on. has grown up through the chat rock before moving onto the West ninety acres. Unable to recall if there are any large rocks in there, I raise the mower deck a bit to be cautious. I could only drive forward and back up to each fence line instead of turning around due to space. Backing up for the last eight feet stretch, I shifted into forward, let the clutch out and hear the dreaded sound. 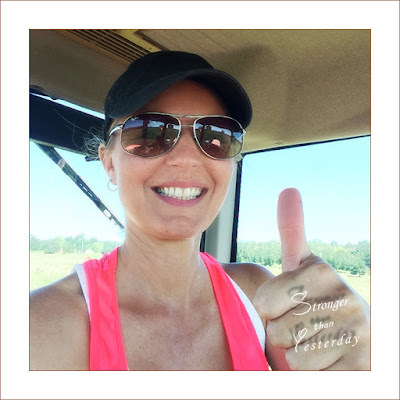 For the second day in a row, I hit the PTO with my fist as I braked, idled down and threw the tractor into neutral with a plethora of emotions swarming over me. I'm not sure how I exited the cab so quickly or how I did not stumble as I shuffled to the rear of the mower. As I neared the fence, I saw her. Her eyes tell me she has passed, but she looks perfect. I instinctively reach out and her black hair is hot from the sun and her heart is beating ferociously against my palm. I hope against the odds as a mere thirty seconds pass by as her heart slows to nothing. Looking her over, I find only a quarter size, "nick" on the back of her head. As I pulled the mower forward, she had raised her head from her slumber. I'm sick with despair. I took the very life that I had worked so hard to save the day before. Sitting on the tire of the mower, my heart feels like there is an anchor tied to it. This is not the first farm animal tragedy, but it is the first dealt by my hand. It is not just the unnecessary life taken, but each farmer understands that a dead calf does not pay the bank note. There is nothing left that I can do. I tell her and her Momma, "Sorry bout that." and climb pathetically into my tractor seat. "These are your final days. See you on the other side." Finding myself in the tractor on Wednesday, I had a few hours to clip our lush pastures. A bit late in the summer for us due to the heavy amounts of rain we've had this season. My previous two weeks had overwhelmed me so I welcomed the monotony of circling those green fields. Although I believe my son gets his mowing skills from his Mother, because when I bore of the same section, I move to another for a change in scenery. The day was bright and sunny, I was working outdoors and I crank up the IPod because I am in a "I can do anything" type of mood. I slip on my sunglasses, not because I need them in a cab tractor but because I think I feel cooler with them on as I vibrate the windows of the Kubota with some classic rock. As I make my turns I leave the easy sections for last. Making a few passes, I happen to glance from watching the edge of the brush hog in my drivers side mirror, to the front tire. Simultaneously stomping on the brake as I punch the yellow PTO button, I stare into the tall grass. 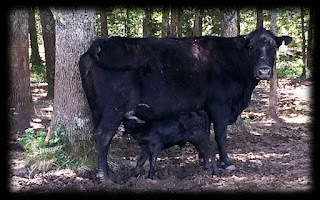 chewing into a freshly born black calf. Backing up a bit, my mind is still in "Surprise!" mode as I step down the metal rungs into the hot pasture. We aren't due for our first Fall calf for a minimum of three weeks. Approaching her, I scan the fields for any sign of Momma while I nudge the calf with my foot. Nudging harder, it still is not moving. Bending down I lift her to her feet while my eyes are darting left and right ensuring that I do not have an angry cow with me in her sights, I realize this heifer is unresponsive. She is hot with only slow, slight movement in her eyes. Oh dad gummit! 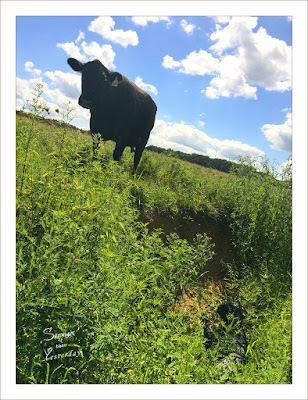 I bawled many times and Cow 131 trots within fifty feet of us and acts like she doesn't know this is her calf. Leaving the baby where she lay, my only assumption is to get her to the shade. Trading the tractor for the truck, I'm wondering how I'm going to lift her onto the tail gate. Four heaves later she is partially up there and I shimmy until she is fully loaded. In hind sight, I should have just loaded her right onto the top of the brush hog. Unloading was a tad easier. Momma doesn't want to have anything to do with her so I rub on her body, trying to get a response. I then make a 20 minute round trip home and back, toting a bottle that I forced down her gullet. Instantly I heard her belly grumble as the milk made contact with her tummy. little cow eyes were no longer glazed over. She called her Momma, weakly and I said, "I"ve done all I can do." I continue to mow the grass, doing a "drive by" every so often. An hour and a half later I see her swaying beside her Mother, suckling. better.............until I look over and I see Cow 149 crap out a calf of her own and stare as it hits the ground and immediately rolls off the back of the pond bank! It landed a few feet below her in culvert of sorts and we both gawk in disbelief. Cow 149 was the first to recover as she called out to her offspring. I did try to pull it out of it's predicament, but I had a hormonal, angry cow try to charge off the embankment at me and I thought, "Let's end this day well." I'll come back later with reinforcements to check on these two. And that I did. A couple of hours later when we checked both sets of cow/calf's, all was well with my day. I am proud of this day because I have a fantastic teacher, who is patient and sees my eagerness to learn and who rarely puts boundaries on what I can attempt alone. I have watched and listened for four years and felt I knew how to handle the situation without calling for help. What I see is progress in myself and that I can have a boss, who is also my husband, put his trust in a herds woman, who is also his wife.